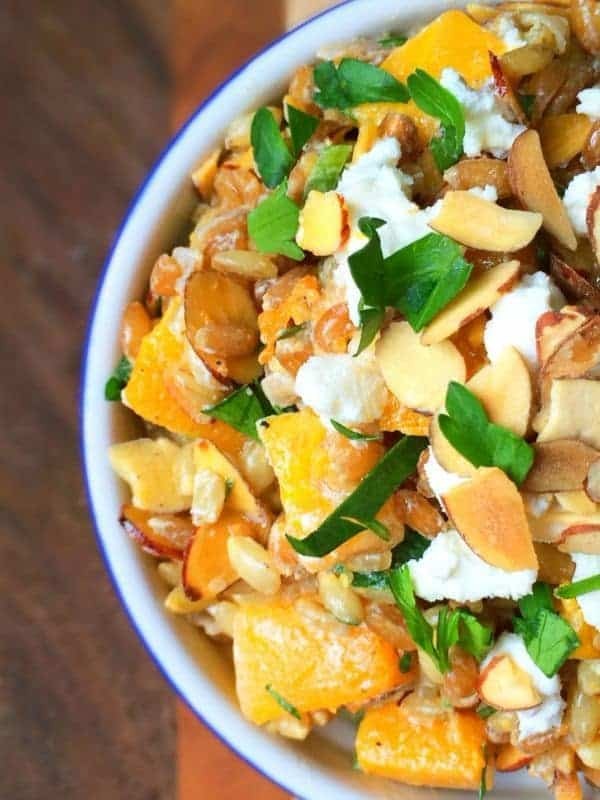 Roasted butternut squash is tossed with chewy spelt, creamy goat cheese and toasted almonds to create this healthy and satisfying salad. Friends – I am so excited to tell you about this incredible salad. Back in December, my good friend Kristen and I were chit chatting about what we planned to make for Christmas. While I always make my Great Aunt Vieve’s famous hummus platter with toasted pine nuts, I signed up to bring a side dish as well which was the perfect opportunity to try a new recipe. Within days (hours?) Kristen told me about this Roasted Squash with Farro and Almonds Recipe from Southern Living which immediately got my wheels spinning. I decided to give it a Middle Eastern spin by using fresh lemon juice and zest, scallions, parsley and olive oil. In fact, the dressing is almost identical to what you would find in Tabbouleh Salad or a Syrian Potato Salad. For added richness, I used butternut squash and creamy goat cheese. When you start to toss the salad, the goat cheese actually starts to melt a bit creating an incredibly luxurious vinaigrette. Any grain would work for this dish. To make it gluten free, use quinoa. I actually had two open bags of spelt and barley so I decided to use a combination of the two. 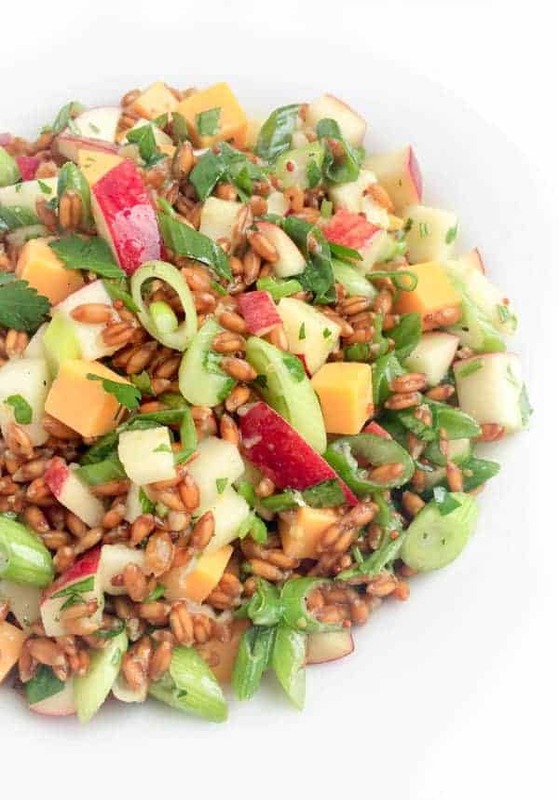 Farro, bulgur wheat or wheat berries would all work well in this dish. Use whatever you have on hand! Pre-heat oven to 350 degrees and line a baking sheet with foil. Spread almond slices on baking sheet and toast in oven for 6-7 minutes or until lightly browned. Remove from oven and set aside. While almonds are toasting, toss butternut squash cubes to coat with half of the olive oil (2 tablespoons), half of the salt (1/2 teaspoon) and half of the pepper (1/4 teaspoon). Spread out on the same foil-lined baking sheet you used to toast the almonds and roast for 20-25 minutes or until fork tender. 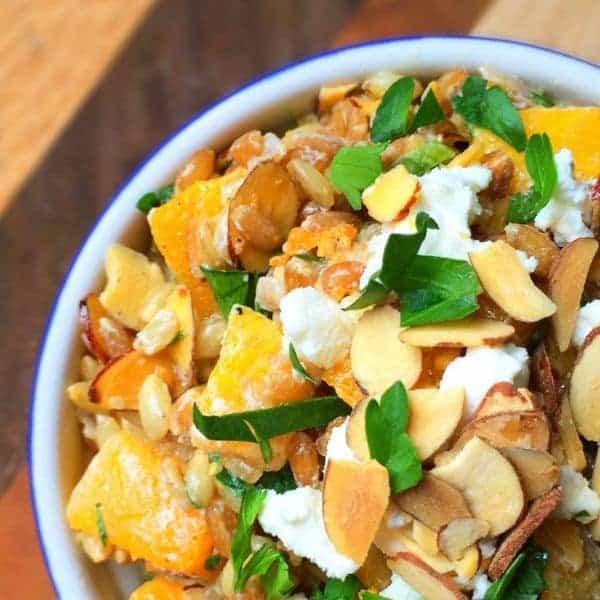 In a large bowl, toss cooked spelt with roasted butternut squash, scallions, parsley, toasted almonds and goat cheese. Toss with lemon juice and zest plus the remaining olive oil (2 tablespoons), salt (1/2 teaspoon) and pepper (1/4 teaspoon). Check for seasoning and adjust accordingly. Serve warm, room temperature or cold. Salad can be stored in an air-tight container in the refrigerator for up to 3 days. 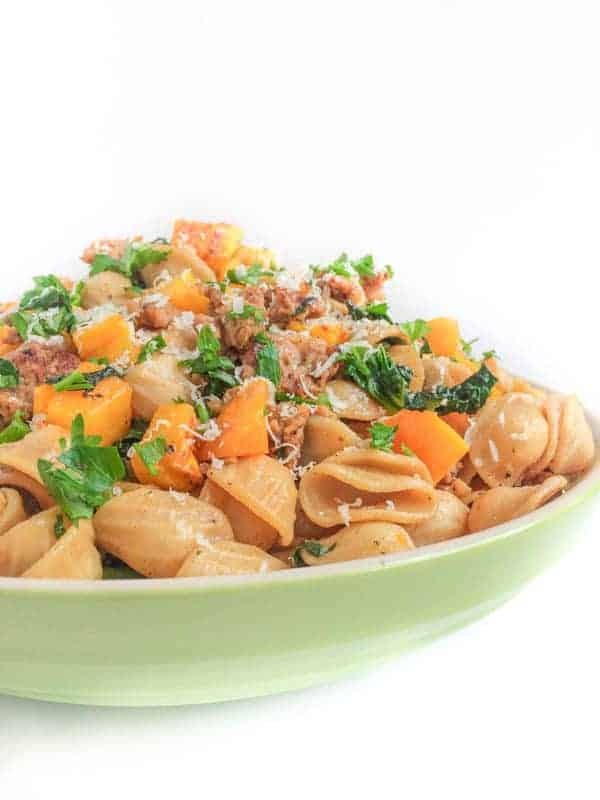 Butternut squash and goat cheese are MFEO – Made for each other!! Love it!! Thank you so much for sharing friend!! Made this today for a work potluck….LOVE IT!!! Used farro instead of spelt and forgot the goat cheese and it was still delicious! Thanks Liz! Oh I’m so so thrilled!!! Yahoo!! Wow, this looks mouth watering! What a delicious savory salad :) can’t wait to dive into this beauty! It’s really so good – I hope you make it! I just devoured this at lunch. So. Good. I was just thinking that I need more lunch-y salad ideas and then this post showed up in my inbox. Perfect! What perfect timing!! Let me know what you think if you make it!! You and me both!! I’m hooked on it! What a fabulous salad! I need it after all of that crazy food for the super bowl! This is the perfect detox salad that doesn’t taste like health food. I love all of the flavors in here. You would never know it’s actually a salad! Exactly!! It was devoured at Christmas – I was so glad everyone loved it!! Butternut squash, goat cheese, AND spelt?! This is definitely my kind of salad! 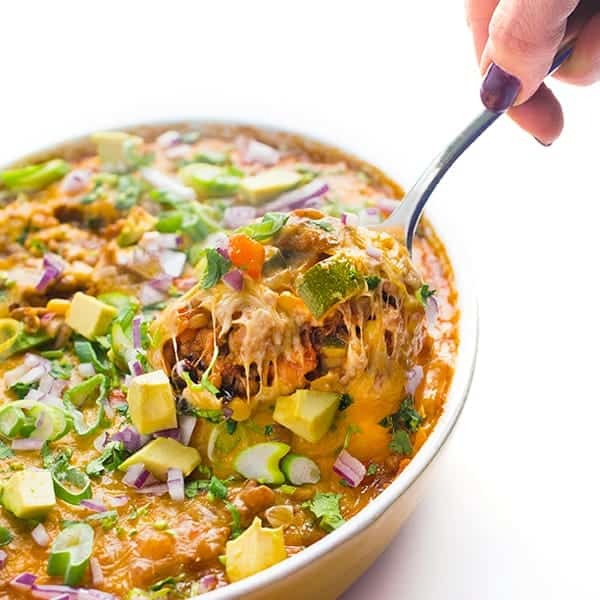 This salad sounds totally delicious – really hearty and nutritious but with so much flavour too. Love it! Oh thank you so much Kathryn! Sounds great, Liz, and I haven’t tried spelt yet, so this will be a new experience for me! Let me know how how you like it!! You had me at goat cheese, Liz! Love the bit of crunch from the almonds, too. Is there anything better than goat cheese? I vote no. Um, I could really go for two bowls of this after yesterdays gluttony!!! 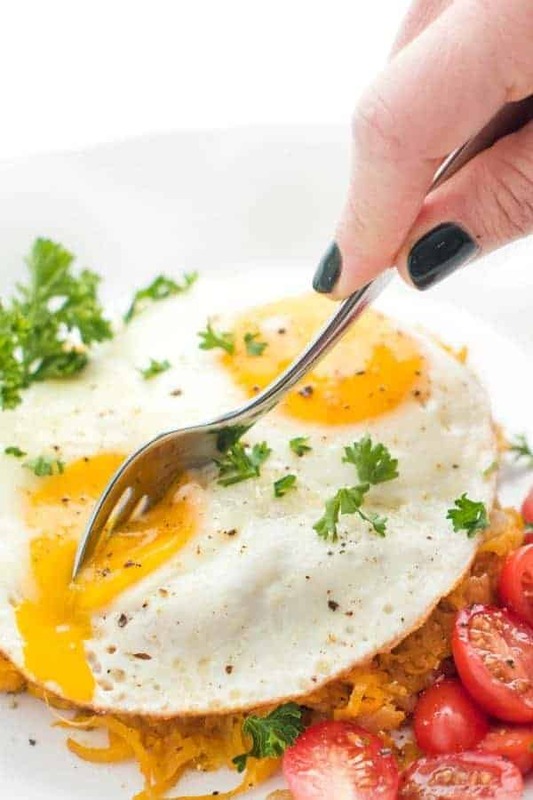 Looks delish, friend! I wish I could send you some!! Thank you Maria! I hope you’re feeling well! Liz, this looks and sounds amazing! So much more going on in this than your typical tabboulleh. Pinning! This is like Tabbouleh’s feisty cousin – lol. Oooo, this salad is perfect!! Need it today after Superbowl binging yesterday, lol!! I am loving the flavors in this salad Liz. Nothing like a great Winter salad. This looks AHMAAZING!! Do you deliver? Um YUM! This is what I want for dinner. You shall have it then. See you at 6? 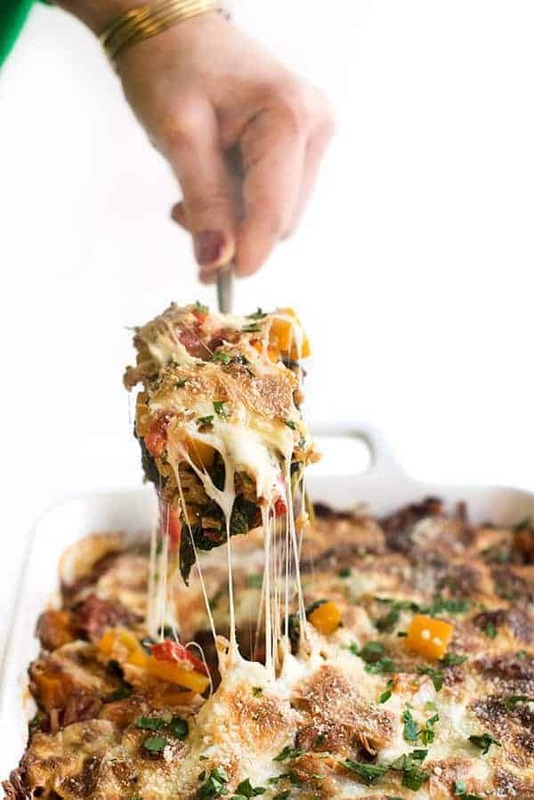 Now this is my kind of salad… Super hearty and loaded with cheese. Looks great Liz! Definitely have never cooked with spelt, or eaten it when it’s not in bread form! But, goat cheese, almond and any kind of squash are some of my favorite foods so I am more than in for trying this! Lovin’ the Middle Eastern spin her Liz!